Over the years, we’ve received many requests for recipes. Our award-winning kitchen wins over the heart (and taste buds) of guests and leaves them wanting to re-create meals for their own loved ones. We’ve decided to start featuring our talented Chefs and one of their favourite recipes each month, getting them to cut back measurements and amounts from feeding 900 to feeding your family. This month, we’re featuring our Senior Sous Chef, Serge Belair. 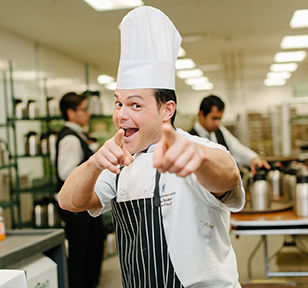 We recently spotlighted Chef, Serge Belair, in our blog series: Working at the SCC. Serge is one of Edmonton’s finest young chefs, blending creativity with practicality in managing the Edmonton Convention Centre’s (SCC) busy industrial kitchen that can churn out thousands of high quality meals a day. He has been a part of SCC’s culinary team since 2005 and is a beloved personality here. Recently awarded a Top 40 Under 40 award from Avenue Edmonton, he has a very bright future ahead of him. 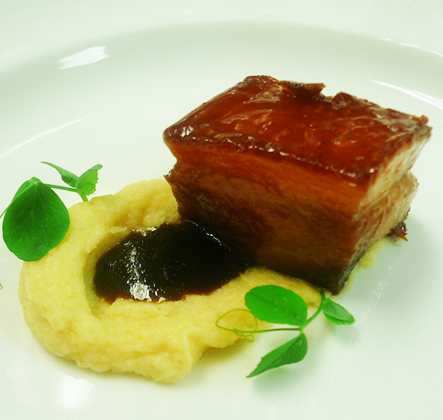 One of his favourite recipes is our Maple Flavoured Confit Pork Belly; this dish will wow your family and friends. It’s full of authentic French-Canadian flavours and is relatively easy to recreate. Cure pork belly with salt and sugar mixture for 1 hour. Set your oven at 300 Degrees and melt duck fat. Clean pork belly under cold water and dry with paper towel. Once pork is ready, refrigerate for a couple hours. Reduce the maple syrup on low eat by a quarter. About 15 to 20 minutes. Set a home deep fryer at 365 degrees to fry the pieces of meat. 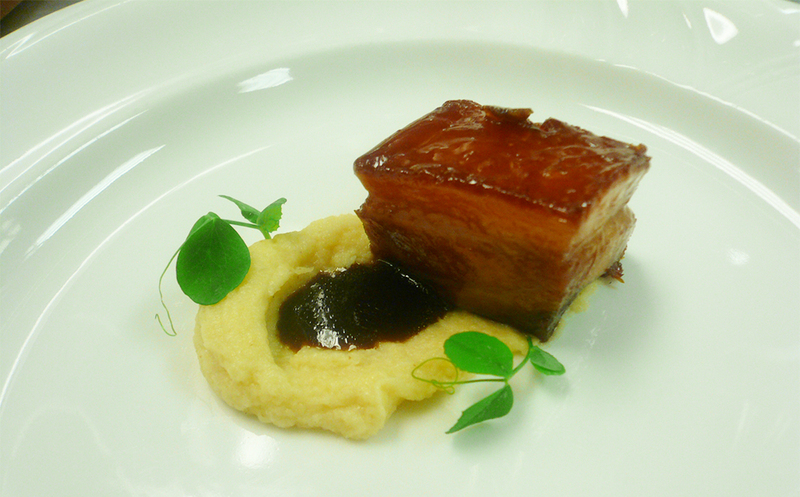 Portion pork belly into desired size, 1 inch cube is the ideal for crispier surface. Fry piece of pork for 4 to 7 minutes until golden brown and really crispy. Immediately season with coarse salt and tossed in maple syrup. Serve as is, on slider buns or Chinese pork buns. Caution, it is really addictive. Bon Appetite!